Mahatma Gandhi walking with associates, Delhi, April 1946. Mahatma Gandhi addressing people from the coach in South India, February 2, 1946. Mahatma Gandhi in greeting pose at Bombay, March 1946. 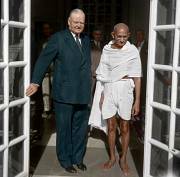 Herbert Hoover with Mahatma Gandhi, New Delhi, April 24, 1946. Mahatma Gandhi after a British Mission Conference on Indian independence, Delhi, April/May, 1946. 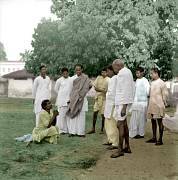 Mahatma Gandhi greeting people shortly before evening prayer at Harijan Colony, Delhi, May 1946. 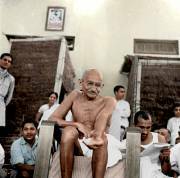 Mahatma Gandhi shortly before evening prayer at Harijan Colony, Delhi, May 1946. Mahatma Gandhi during evening prayer at Harijan Colony, Delhi, May 1946. 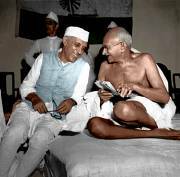 Jawaharlal Nehru joking with Mahatma Gandhi, Bombay, July 6, 1946. Mahatma Gandhi during his peace march in Noakhali, November 1946. Mahatma Gandhi during his peace march in Noakhali (East Bengal), November 1946. Mahatma Gandhi and others during Gandhi's peace march in Bihar, March 24, 1947. Mahatma Gandhi talking to a blind villager in Bihar, March 26, 1947. 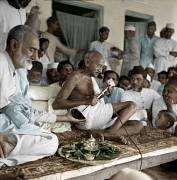 Mahatma Gandhi and associates during Gandhi's peace march in Bihar, March 28, 1947.